This article is about the character. For writer, see Rob Zombie. "House of a Thousand Donuts"
Rob Zombie is an American musician, film director, screenwriter, and film producer. While taking a tour of backroads diners, the Simpsons pass by Rob Zombie. Rob is seen holding up a sign that reads "Zombie needs a lift!!" 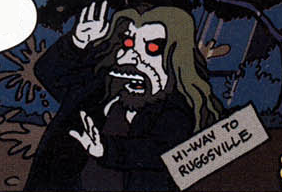 The family later passes him again, and he is seen with a different sign, reading "hi-way to Ruggsville". Modified on February 18, 2013, at 17:02.